Find a direction, see your latitude and longitude, find level, or match a slope. See your location. To see your current location, go to Settings > Privacy > Location Services and turn on Location Services and Compass. For more about Location Services, see Privacy. Stay on course. Tap the screen to lock in the current heading, then watch for a red band to see if you’re off course. Important: The accuracy of the compass can be affected by magnetic or environmental interference; even the magnets in the iPhone earbuds can cause a deviation. 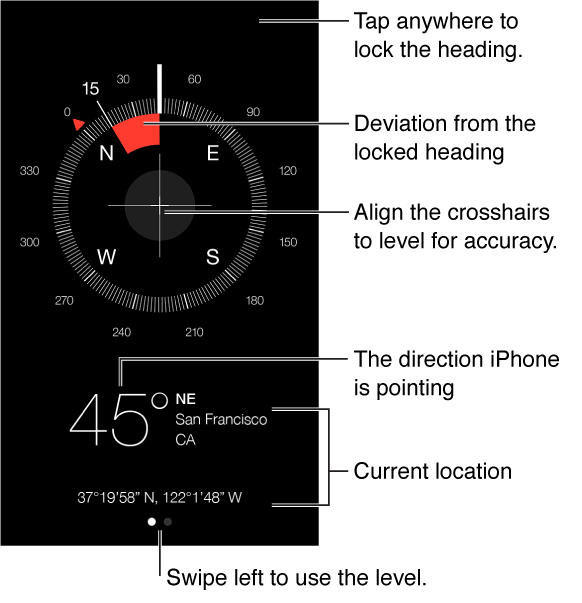 Use the digital compass only for basic navigation assistance. Don’t rely on it to determine precise location, proximity, distance, or direction.